Artificial Intelligence (AI) has evolved with time in the technology landscape, making it a guiding force for various industries in the last few decades. One such sector which has seen a lot of improvement in terms of facilities due to AI is healthcare. Juniper predicts the success rate of bot interactions in the healthcare sector (those completed without relocation to a human operator) will move to over 75% in 2022 (source). Also, key clinical health AI applications can potentially create $150 billion in annual savings for the U.S. healthcare economy by 2026 (source). With a lot of development of healthcare facilities, things have dramatically changed with the advent of AI. This has not only helped in developing the facilities and infrastructure but has also opened new avenues in medicine research making it interdisciplinary to the behest of mankind. 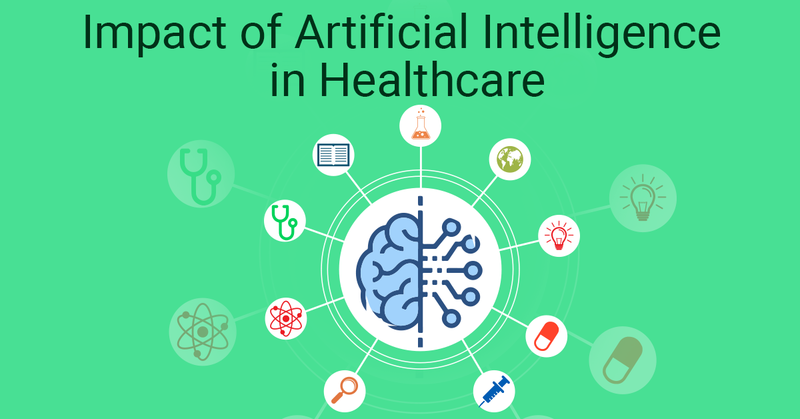 Some of the visible areas where AI has helped are in treating patients, providing medical facilities, designing medical instruments, the way surgeries are performed, in the detailed diagnosis of the ailments and making the treatment reach even in the remotest areas with Virtual Consultation. But before we have an insight into the transformation which AI has brought in with it, let us first have a quick look at what AI is all about. Artificial Intelligence enables computers to simulate and depict human-like intelligence. This involves interaction, interpretation and decision making. With the rise of data gathered by enterprise about their customers, it’s rather now to train an AI algorithm and make it more efficient and accurate in predicting outcomes. The main reason behind developing AI is to assist professionals in different fields with logical decision making at larger scales. Because of so much research and work being done in the past decades on AI, it has become very easy to develop and integrate AI in various existing systems. AI has brought in virtual assistants like Alexa, Siri and Cortana which makes it simple to manage daily tasks by integrating with different apps, demonstrating intelligence. With AI, self-driving cars have surfaced which are likely to make lives easier. AI has enabled radiology with smart diagnosis, digital image processing and analysis aiding in the identification of ailments. For example, Digital image processing is useful in enhancing the efficiency of X-Ray, MRI and CT scans. The AI algorithms are now trained to identify various diseases by scanning X-Ray, for example. This greatly reduces the need for human intervention. With the improvement in the diagnostics, various types of cancer could now be identified at very early stages, which was nearly impossible previously. Not just cancer, AI can identify other diseases quite efficiently too. AI is aiding the research and development in the field of medicine. With the help of data mining and analysis of huge data involving patients surveys, AI is assisting the research in medicine by letting out definitive directions in the path of research, saving time and cost. This way drugs are deeply analyzed and their potential in treatment is realized using AI, which brings down the production cost, making the treatment more affordable to everyone. Gone are the days when people faced mobility issues due to amputation. With the advent of Smart Prosthetics using AI, they are able to lead a normal life independently. Smart prosthetics not only look like body parts but also sync with the body to perform the tasks naturally with the help of neuro-receptors connected to them. Earlier the patient’s medical records were kept in physical files which often got misplaced and could not be accessed easily. Data mining and big data algorithms have been helping hospitals and healthcare institutions to capture the medical records of their patients on the cloud. This can be used anytime in future to get in-depth insight into the patient’s medical history to be able to predict the patient’s conditions using AI and provide them with better healthcare. These medical records, which help the doctors to determine the patient’s medical condition, not only aids them in diagnosis but also helps them in treating them by ruling out several other possibilities. While Artificial Intelligence is still evolving with every passing day, it is helping the healthcare sector emerge both in terms of facilities and scale. Having the assistance of AI, doctors are now able to provide the right treatment with a quick diagnosis at the early stages. A fast-paced development in medicine has led to the discovery of drugs which could treat even the deadliest of the diseases. AI has helped in the research of Cancer medicines and has automated radiation planning for the patient. Apart from this, the AI enabled smart prosthetics have been helping patients suffering from mobility challenges such as in the case of Motor Neuron Disease in leading a better life. Given the pace of development, it is predicted that the scale of healthcare would increase by several folds, being able to serve even those who still lack access to the medical facilities. With these possibilities and constant work in the interdisciplinary fields of AI and healthcare, the future seems to be bright bringing widespread access to making life better.